1- What is the relationship between the fatwa of the radical sheikhs and the extreme jihad? Islamic Jihad of self-defense does not need fatwa or religious justification, because it is acceptable as a high human value to defend yourself if you are wrongly attacked. The extreme Jihad needs this justification, and it is usually issued by verdicts or fatwa, to be applied by those who believe in those Sheikhs and their dogmas. 2- So, we have here two kinds of extremist, the sheikhs and their assistants who issue the fatwa and publish it, then the criminals who apply it by killing the people. Is this right? Yes, but I can say the criminal who applies the fatwa and kill the people is really a victim also, because the sheikh and his assistant convinced him - by their fatwa - to do it as a jihad. 3- As a Muslim scholar and Sheikh from Al Azhar, do you issued any fatwa? Yes. In my researches, books and lectures and speeches, I needed to issue many fatwas that confirm the peaceful face of Islam, and proving the contradiction between Islam and the Salafi Wahhabis religious culture and jurisprudence. It was my fatwas against theirs. 4- What was their response? Did they discuss your Muslim perspectives? They should have done this, but they did not. Being unable to discuss all the Quranic verses I usually bring as prove, they accused me to be the fanatic extreme enemy of Islam and apostate to encourage any terrorist to kill me. 5- Did these fatwas against you threaten your life? Sure. In 1987, I used to give lectures in the mosques proving Islam as the religion of peace, tolerance, justice, democracy and human rights, and proving also that the so – called Sunna has the culture of fanaticism and terrorism. I was arrested with more than 40 peaceful people. While we were in the prison, the Egyptian media published the fatwas accused us to be fanatic enemies of Islam to encourage the fanatics inside the prison to kill us. Then we were released, but the Media continued insulting us by these fatwas, so I had to escape to the U.S for about ten months to save my life. Then I had to return back to Egypt to be beside my sons because they were so scared. 6- Is this the only example? No. In 1992, the Fanatics of Egypt committed many crimes against the peaceful Egyptian Christians, and threatened most of the secular intellectuals. So, I and my friend Dr. Farag Fouda worked together to establish a new political party named the Future Party, to defend the Egyptian Christians and to confirm the equality between all Egyptians regardless of religion. One week after the announcement of the new party and the indication of its approval, the fanatic issued their famous fatwa calling for the death of Farag Fouda and me, accusing us to be apostate and the fanatic enemies of Islam. Five days after publishing this fatwa, Farag Fouda was assassinated in front of his office and his young child was with him, he was shot also, but survived after long treatment in the hospital. The fanatics in the trial defended the two criminals saying that Farag Fouda was apostate and should be killed by any one as long as the government did not execute him. According to their jurisprudence, fanatics believe that anyone who converts from Islam should be killed. This punishment used to be applied in the middle ages, and is still applied in the Saudi Kingdom and Iran. The Egyptian Muslim fanatics are calling to apply this penalty in Egypt. Killing Farag Fouda and the trial of his killers was their opportunity to confirm this punishment to apply it by them against anyone who might dare to discuss them. It will be easy to issue a verdict or fatwa against him then he will be killed by anyone. This will terrify any one. The only one who could face them in that time was me. So, I published many articles proving that Islam is the religion of the unlimited freedom of belief and speech in the field of faith, and the religion of peace in the field of human rights. On the weekly forum of the Egyptian literary Najeeb Mahfouz in which we –Farag Fouda and I used to attend -Many intellectuals asked me to write a book about this issue, I did, and it was my book [the Penalty of apostasy] in 1993, which was published four times and translated into English language. 7- Are there other examples about other people? Until 1994, the weekly open forum of Najeeb Mahfouz used to be held on the Nile every Friday after noon, to discuss the fanatic crimes. Najeeb Mahfouz is the only Arabic writer who won the Noble prize, born in 1911. The fanatics threatened us not to attend his forum, but we insisted. Then a campaign against Najeeb Mahfouz began ordering him to repent because his novel [Awlad Haretna] or [the sons of our neighbors] has many heresies. This novel was issued forty years before and he was given Noble Prize for it. I wrote article in the monthly magazine [Al Kahera] or [Cairo] accusing them to commit the character assassination against Najeeb Mahfouz to encourage someone to kill him as it happened in the case of Farag Fouda. Six months after that campaign, Najeeb Mahfouz was stabbed in his neck in front of his home on October 14, 1994. The criminal confessed that he never read anything of Najeeb Mahfouz, but he was convinced to kill him by the Fatwa of the sheikhs in that campaign. From 1995 I worked with Dr. Sa’ad El Deen Ibraheem in his Ibn Khaldoun Center, moderating its weekly forum, and conducting the researches in my Islamic fields. In 1998-1999 we had a project to reform the Egyptian education to refine it from the fanatic dogma, and another project to teach Egyptian their political rights. 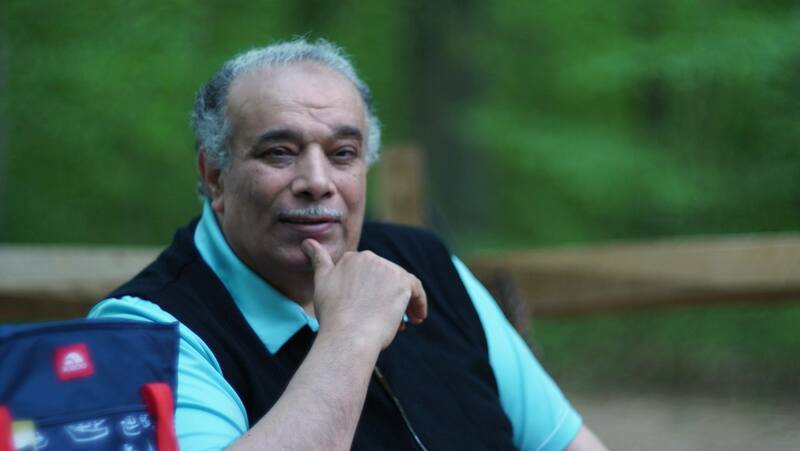 Because of those two projects, many fatwas issued against us, and many of my family members and Quranic trends were arrested, Dr. Sa’ad himself was arrested and the center was shut down, and I had to escape to the U.S for the second time leaving my sons behind.